The Story: We celebrated a big one this year!! 1-0! 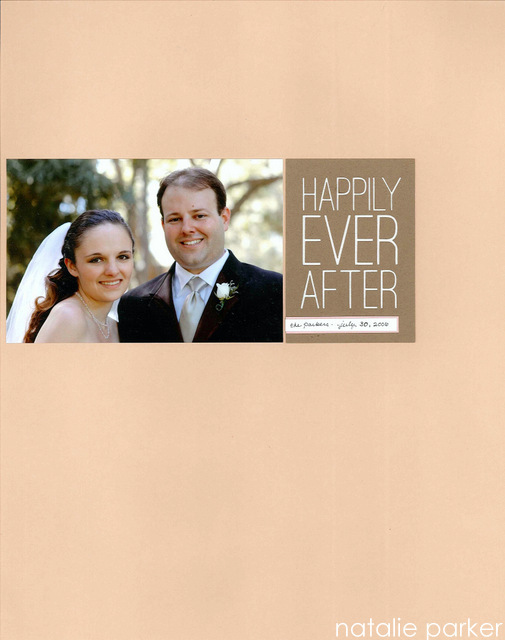 One scrapbook page for every anniversary: We take a picture on each of our anniversaries and I turn it into a scrapbook layout and add it to the end of our wedding scrapbook. I love how the scenery changes and we have changed over the years. Guest book cards: As usual, I picked one “guest book card” that was signed by a wedding guest and included it on the page. 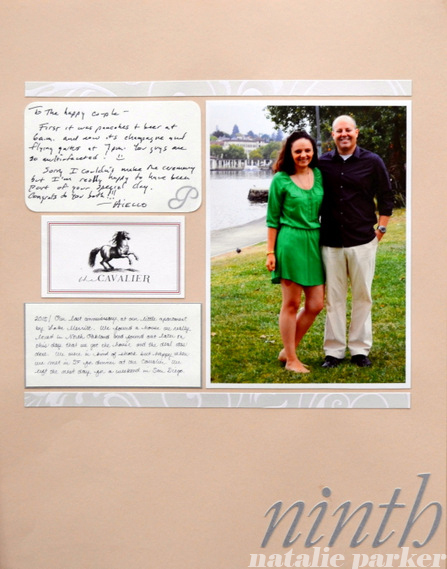 Read more about why we used guest book cards here. More to scrapbook later: I have more pictures of our party and more thoughts that I will likely put into our 2016 scrapbook. This page is to simply mark the year and matches all of its compadres in the Anniversary section (see below). Previous Years: Anniversaries 1-6, Anniversary 7, Anniversary 8, Anniversary 9. 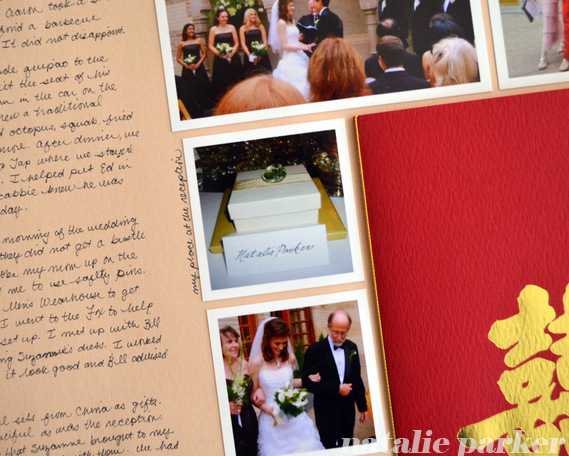 Want to see my entire wedding scrapbook? Check it out here. 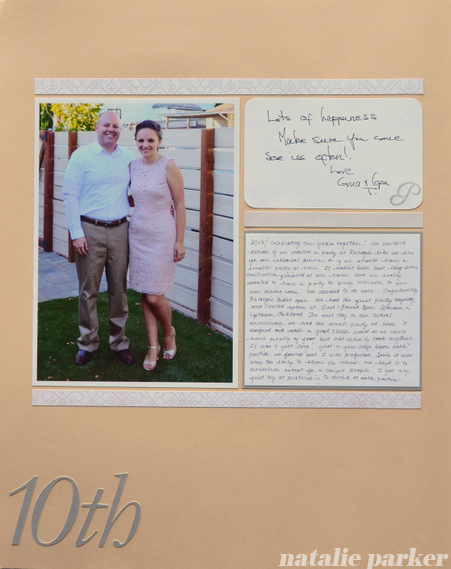 Fonts: Garamond | Tools: Epson Stylus R2000 (photo), Silhouette SD (headline) | Supplies: Epson Semigloss Photo Paper (photo), DCWV Silver & Pearl Shimmer Stock, SEI White Elegance (paper) | Keepsakes Included: guest book card. 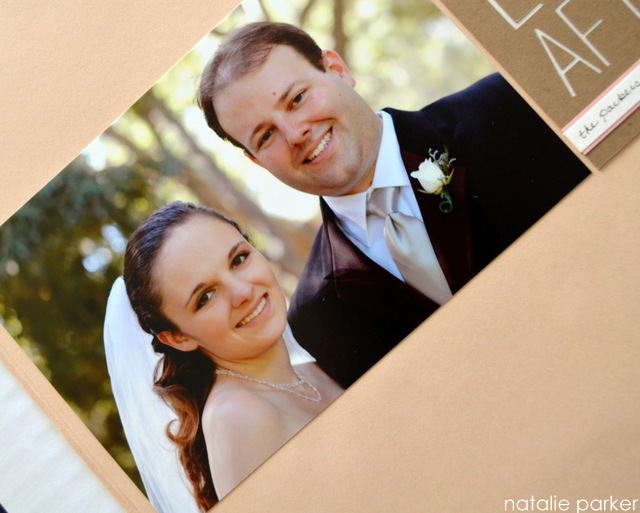 The Story: We celebrated our ninth wedding anniversary a couple of weeks ago. Last year in single digits! Restaurant business card: Also as usual, I included the business card for the restaurant where we had our anniversary dinner. I actually forgot to grab the card after dinner (there was a lot going on that night, more on that later). Mr. P went back a few days later and got one. Previous Years: Anniversaries 1-6, Anniversary 7, Anniversary 8. 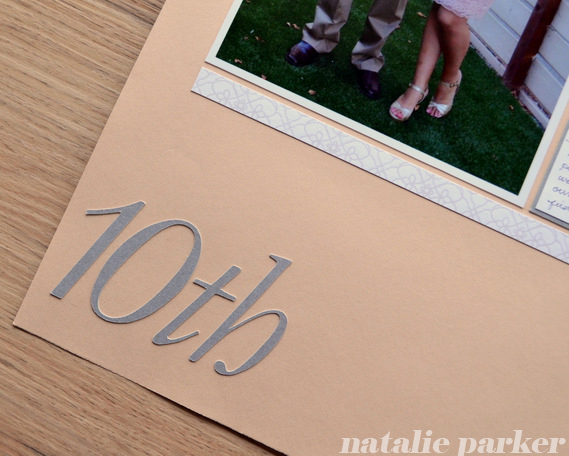 Fonts: Garamond | Tools: Epson Stylus R2000 (photo), Silhouette SD (headline) | Supplies: Epson Semigloss Photo Paper (photos), DCWV Silver & Pearl Shimmer Stock, SEI White Elegance (paper) | Keepsakes Included: Restaurant business card, guest book card. 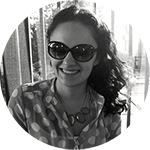 The Story: I was asked to be a bridesmaid in a very dear friend’s wedding. Mr. P and I flew to Atlanta for a weekend’s worth of wedding activities. It was my first time being in a wedding! Other than my own, of course. 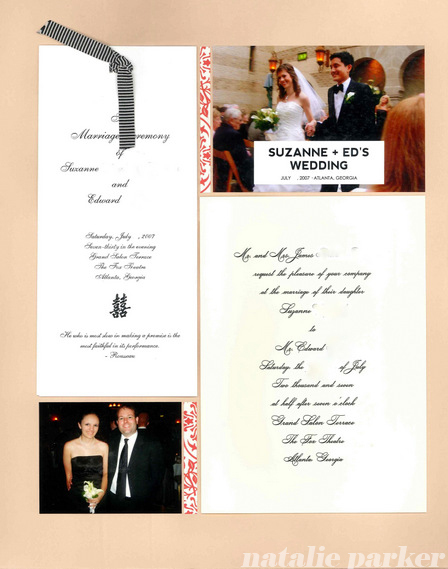 Three Pages, Could Have Been Six: I originally planned one page per event in the wedding. I went to a bridesmaids lunch, rehearsal, rehearsal dinner, the wedding, reception, after parties every night, plus seeing a bit of Atlanta. I stepped outside of the box here and mixed everything together. 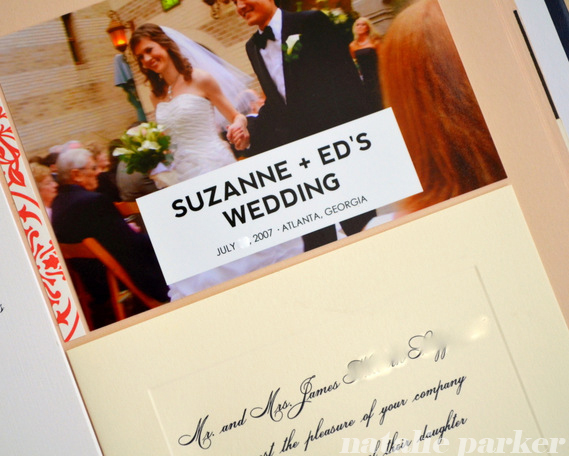 I realized that it wasn’t my wedding so I didn’t have to break it down into ever detail, nor did I have to use every piece of ephemera I saved. Different Sizes, Black and White: I mixed photo sizes and mixed color and black and white photos. It could have been a hot mess but actually ended up pretty cohesive looking! Headline on Photo: This was a new design challenge and I love the clean modern look of how it turned out. 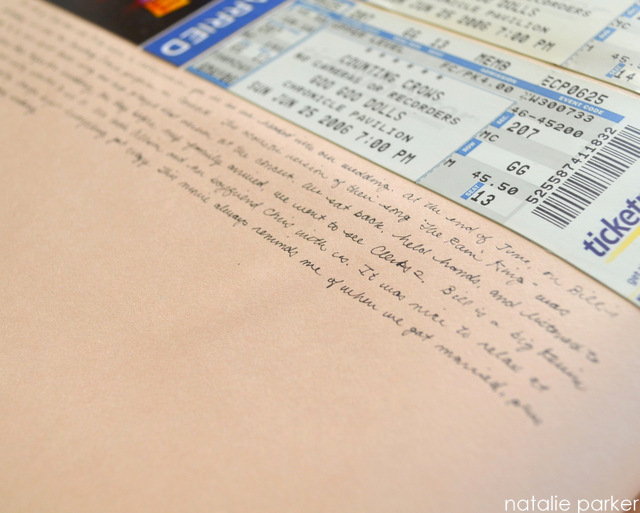 Photos of Important Keepsakes: Remember, when you can’t put something in a scrapbook, take a picture of it. The bride had handpainted fans made in China for the wedding guests. She also bought each of us bridesmaids a pearl set from her friend’s shop in China (she’d take Mr. P and I to that very shop five years later). The mother of the bride also gave each of us a handkerchief to carry with our bouquets. Before working on the page, I put the pearls, the handkerchief, and the fan together and took a picture. Fonts: Nevis, Century Gothic | Tools: Epson Stylus R2000 (photos) | Supplies: Pioneer SJ-100 Jumbo Scrapbook (scrapbook & pages), Epson Semigloss Photo Paper (photos), Fancy Pants Designs/All My Heart (patterned paper) | Ephemera Included: Wedding invitation, wedding program, rehearsal dinner invitation, transit card, boarding pass, room key, brochure. 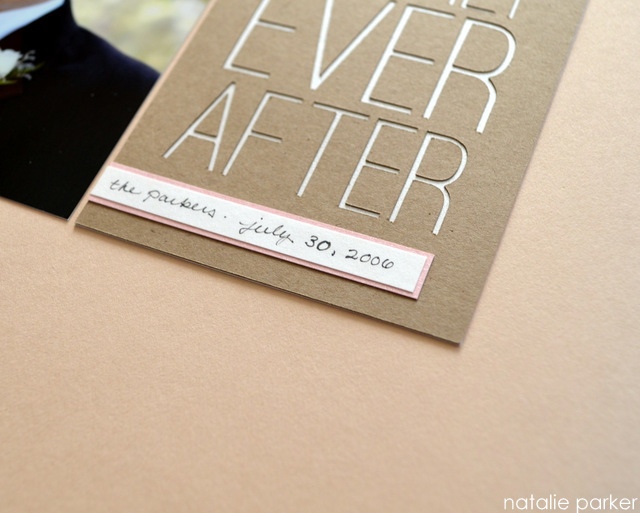 I designed a Happily Ever After card to go with my scrapbook layout celebrating our wedding date. I spiffed up the file and have it here today for you as a free download! 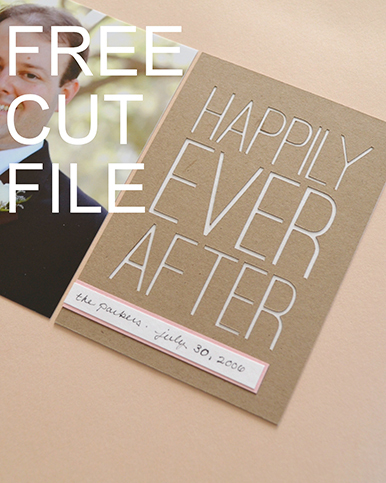 The card is a cut file you can use in Silhouette Studio or other program that accepts SVG files. It looks great on a traditional scrapbook layout (if I do say so myself), but it’s also sized to fit in a 3×4-inch pocket page such as Project Life. 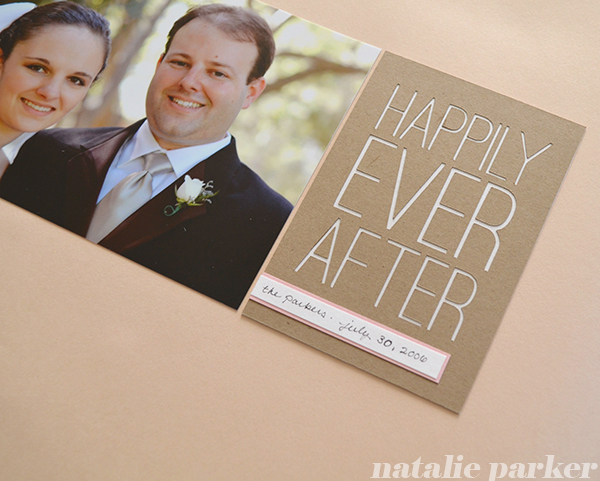 Download away and celebrate the happily ever after moments in your life! Hat tip to Cat Scrap Fever for instructions on converting .studio to .svg. This was my first time trying it so let me know if the .svg doesn’t work. 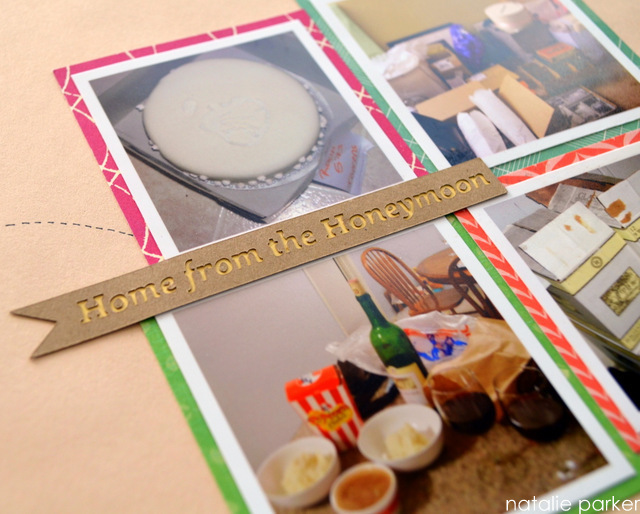 The Story: Our first night home after our Honeymoon. Read the Picture Story here. 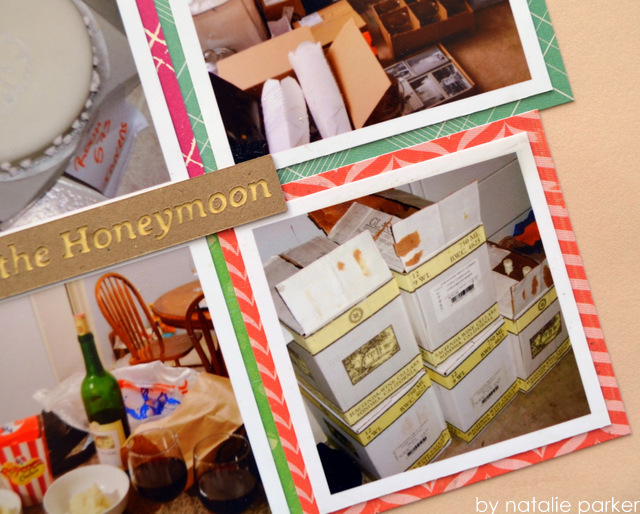 Another Wedding Layout not in the Wedding Scrapbook: By the time I finished scrapbooking our honeymoon in the wedding scrapbook, I was d-o-n-e. I knew I wanted to tell this story but saved it for another time. 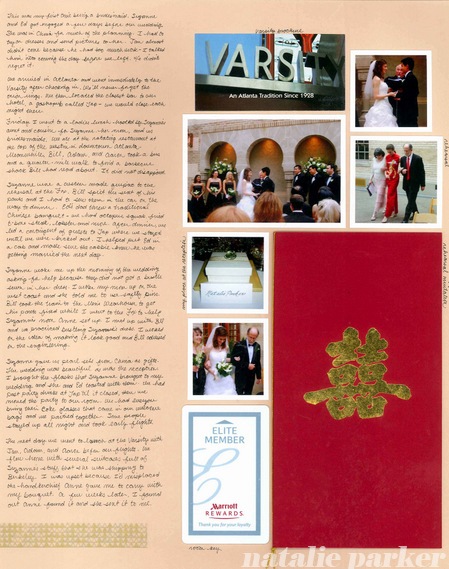 It’s sort of a “return to regular life” layout and that story is better told here in our “regular life” scrapbook. 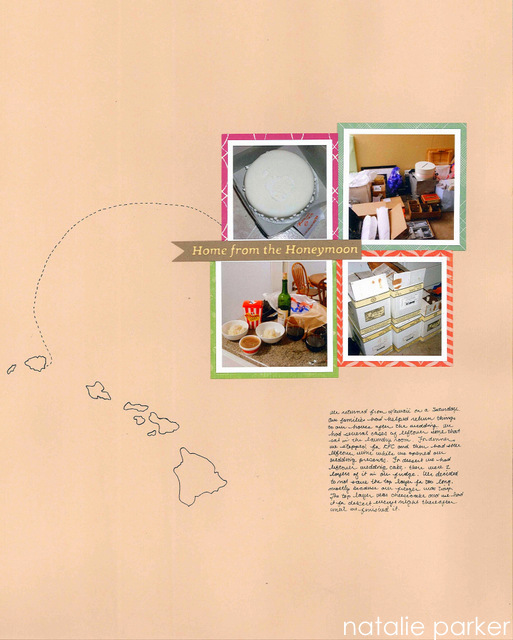 Inspiration: This layout by Geralyn Sy (original post here). 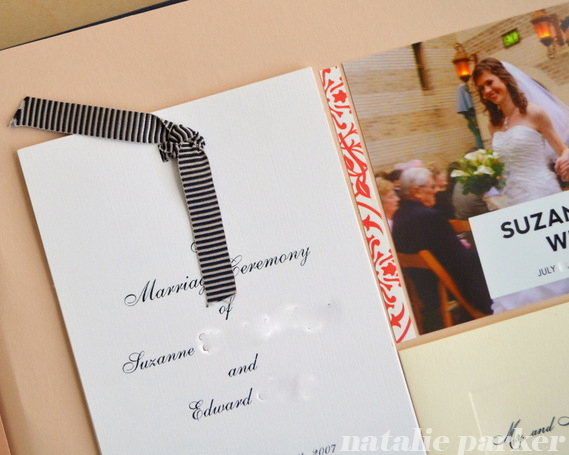 The photos I worked with weren’t of great quality, and I like how the borders of patterned paper really popped them. 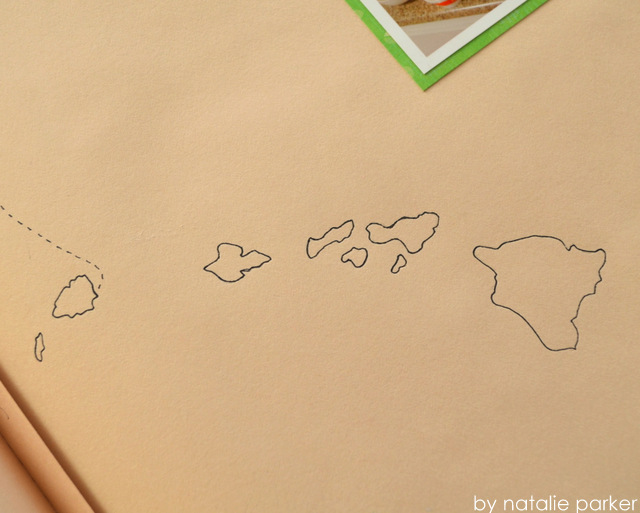 Hand-Drawn Hawaii: Well, more like traced (method here), but I was going for a hand-drawn look. At the last minute, I added the dashes by hand to make it look Indiana Jones-esque. Fonts: Klinic Slab Bold | Tools: Epson Stylus R2000 (photos), Silhouette SD (headline) | Supplies: American Crafts/Amy Tangerine/Get Around, American Crafts/Chap/Mike, Crate Paper/Storyteller/ Tomorrow, Webster’s Pages/Clean & Simple/Sunday Picnic/Poppy Fields (papers) | Ephemera: none. The Story: We got married. 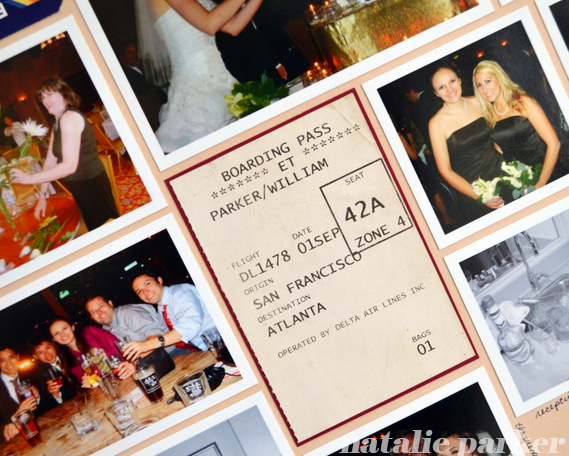 Wait, this IS a Wedding Layout: Yep, it is and it isn’t in our wedding scrapbook. I love context (see here, here, and here). 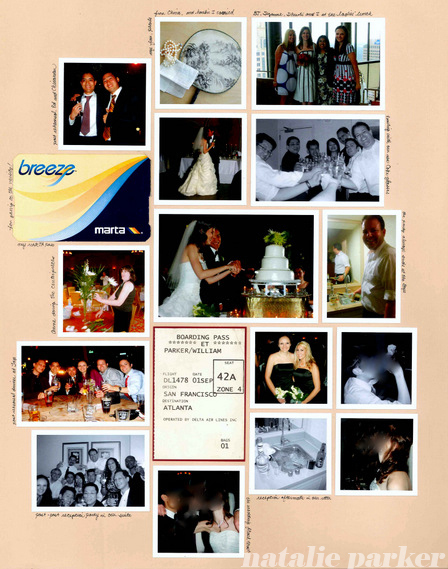 I couldn’t make a 2006 scrapbook without a reference to our wedding. It adds context to the other events that year. It looks literally like a reference — just a small layout to note the event. 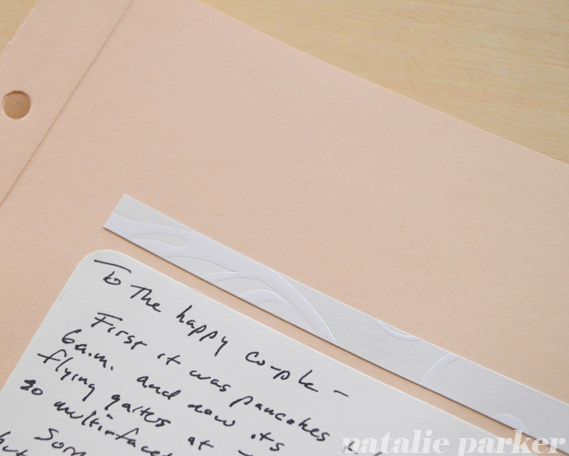 Project Life-Style Card: I’m experimenting again with Project Life-style title cards. I designed this one and cut it using the Silhouette and added the little flag with the date. Shimmer Stock: I’m excited for any project that helps me use up my stash (more like a bunker) of shimmer stock that I bought for the wedding scrapbook. 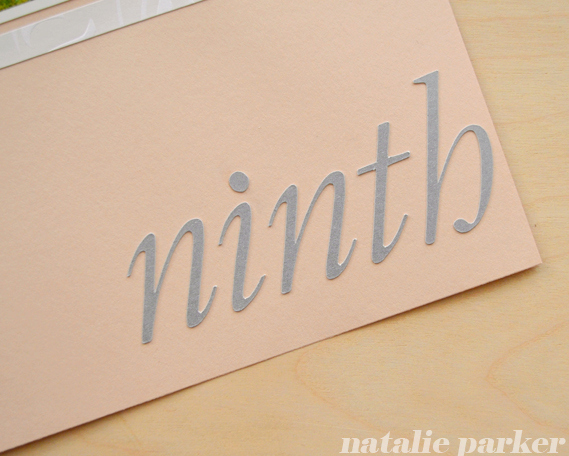 Fonts: Ostrich Sans | Tools: Epson Stylus R2000 (photo), Silhouette SD (headline card) | Supplies: Die Cuts with a View Pearl Shimmer Stock, Reflections Craft Cardstock (papers). 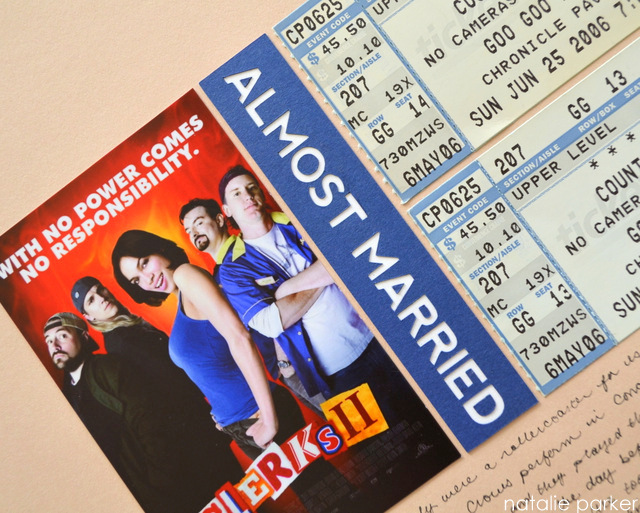 The Story: Documenting two things we did together right before our wedding. They aren’t wedding-related, but when I think back to them, I always think about us sitting at the top of the rollercoaster — that calm time right before everything goes wedding crazypants. The concert tickets are for the band that played our first dance song. The song is pretty obscure and we were thrilled when they played it at the concert. We listened, held hands, and took it all in. Such a great moment. Why is this not in the Wedding Scrapbook? 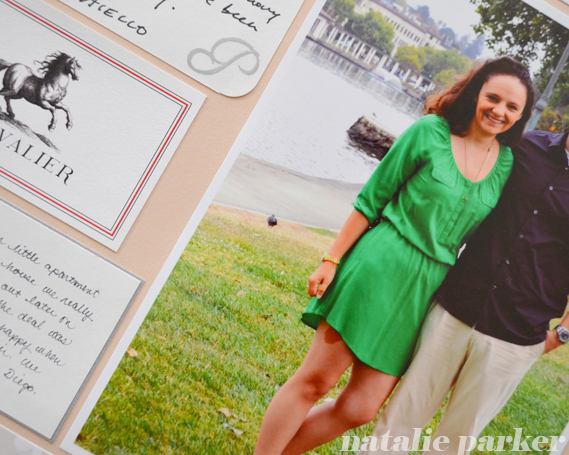 This is the first of some “ancillary” wedding scrapbook layouts that didn’t make it into the wedding scrapbook. 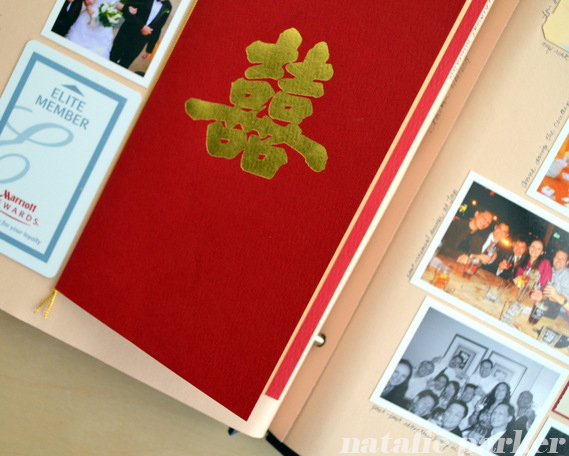 I wanted to keep the wedding scrapbook strictly wedding-event only. Plus, it is too massive as it is. 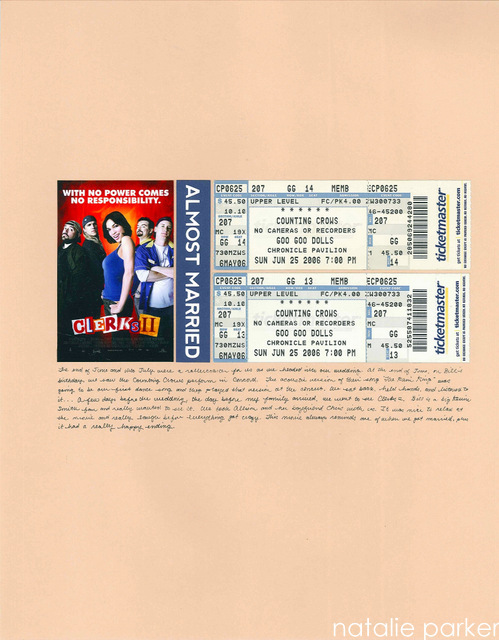 Since planning our wedding was all-consuming in 2006, there will be more wedding-related bits filling out this book. 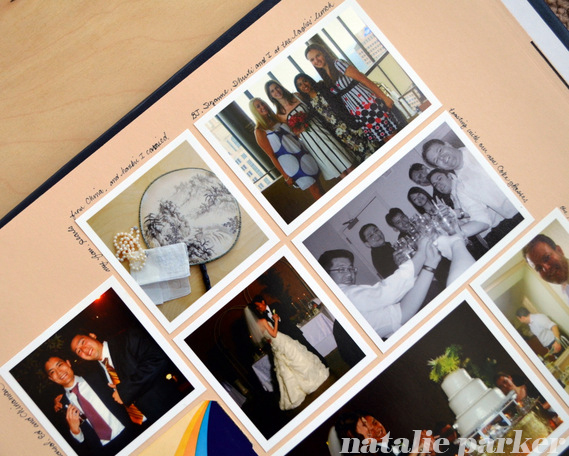 View my wedding scrapbook here. Movie Poster: I used Google Images to find a nice copy of the poster and printed it with my photo printer. I did something similar for my 2005 News page and my 2004 Intro page. Fonts: I forgot to write down which font I used 😦 | Tools: Epson Stylus R2000 (poster), Silhouette SD (headline) | Ephemera: concert tickets.